My family loves salsa and for the men in the family, the hotter the better. 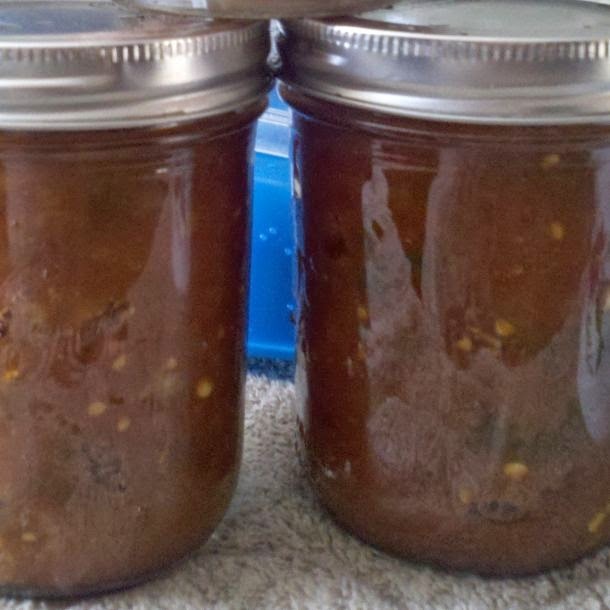 I aim to please so I whipped up a batch of salsa that even made my Marine hubby say "ouch". I could have made it hotter but I like the salsa to be hot enough but still have a good taste. 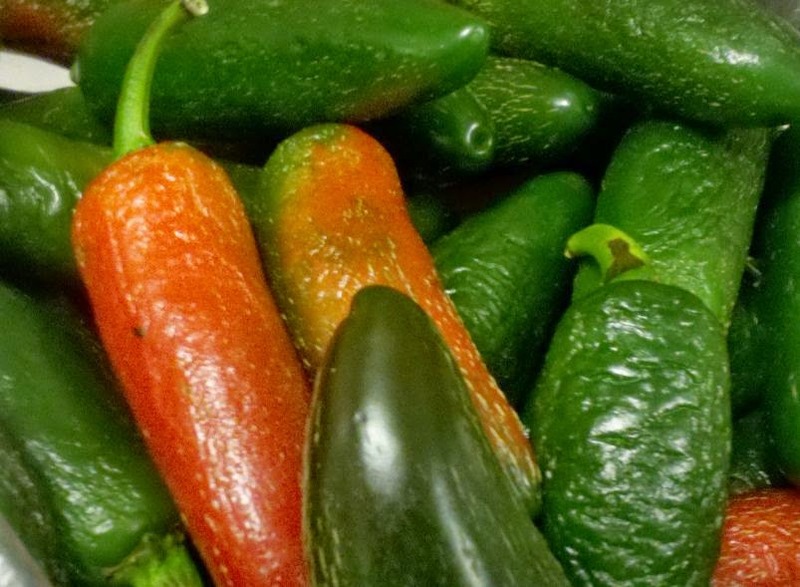 Some hot salsas are pure fire and nothing more. Mine is not that way. Cut up the jalapeno peppers and the habenero peppers and put the diced pieces into a pot. Be sure to put the seeds into the pot too. Cut up the tomatoes and add the tomatoes and the rest of the ingredients to the pot. Bring it to a boil and simmer for 30 minutes. As it is simmering, prepare your jars by heating the lids and jars in hot water. After simmering, put the salsa in the hot jars (filling within 1/2" and wiping rims) and water bath process for 20 minutes. We had an abundance of butternut squash this year again. If you ever want something simple to grow, grow butternut squash. We didn't even plant butternut squash this year. We threw out some seeds, after eating the squash, and it grew up wild all over the place. One of our favorite ways to preserve butternut squash is by making "chips" with them. My hubby and boys snack on these just like you would a potato chip. 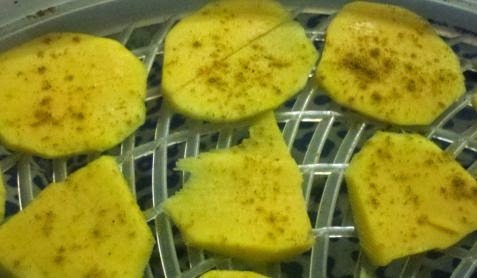 All you have to do is wash your squash and using a vegetable peeler, peel the squash. You also need to cut the ends off of the squash. Some people do it before peeling, some after. It doesn't matter when you do it, whichever works best for you. 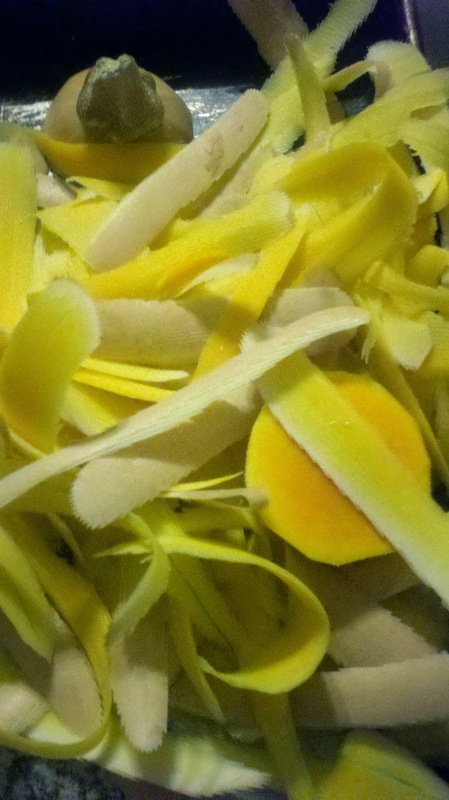 We save the ends and peelings and feed them to our goats and chickens. They love them. Now, using a mandolin, slice the butternut squash. 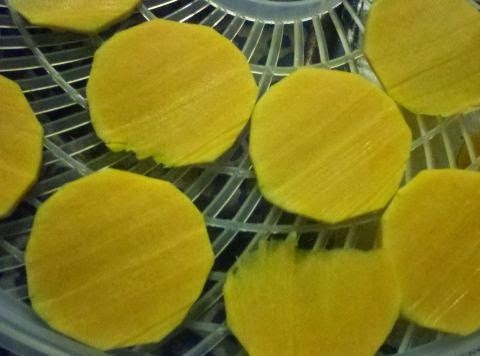 Put the squash on your dehydrator trays. You can leave them plain but my family prefers to add some extra flavor to them. 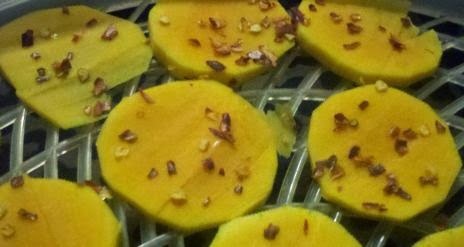 From my experience, the three spices that go well with butternut squash are salt, crushed red pepper or curry. They take about 6-8 hours to be completely dehydrated. If your family plans on eating them right away, you can store them in baggies. If you plan to store them for a long time, just place them in a canning jar and put a lid on it. I have stored them easily this way for over a year. 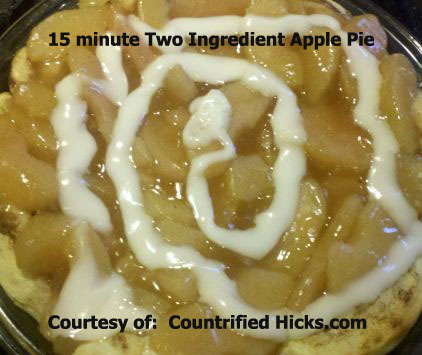 I love recipes that are simple easy and no recipe can be much easier as only 2 ingredients to make a yummy dessert! Yep, that is all it takes. 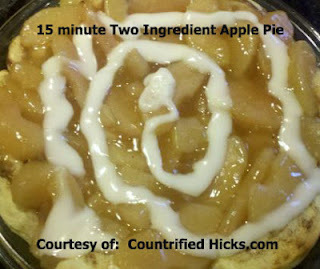 I used the "No sugar added" apple pie filling for this. It turned out beautiful and so delicious. 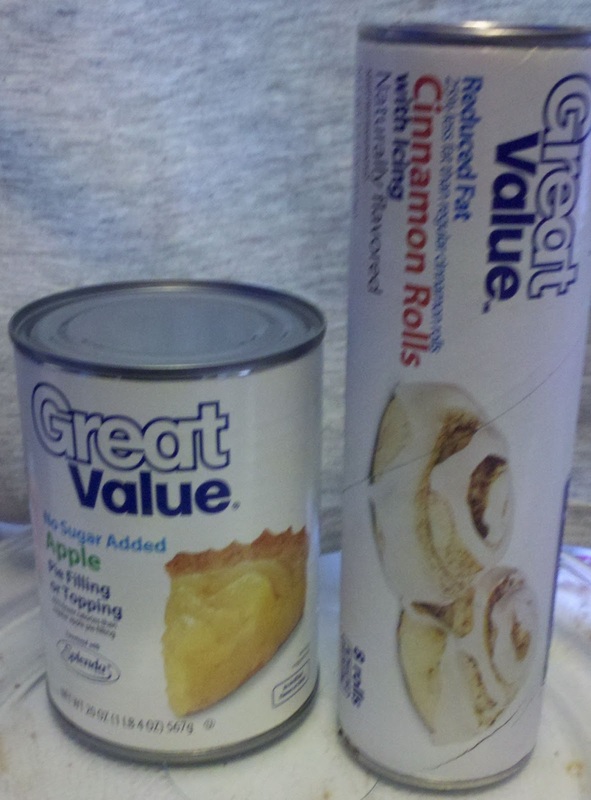 All you do is open up the can of cinnamon rolls and press them into a pie plate. Smooshing down the cinnamon roll. Then open up the can of pie filling and pour it on top. Place in a preheated oven to whatever temperature is called for the cinnamon rolls. I first tried cooking the pie at the recommended time of the cinnamon rolls but found the dough on the bottom was not done so I cooked it 7 minutes longer. So I recommend to add 7 minutes to the time it is called for. 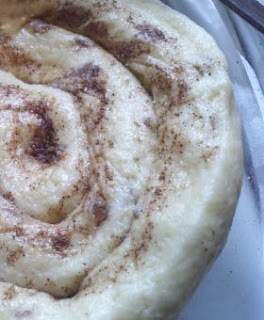 Once you remove it from the oven, pour the cinnamon roll icing on top. This is AMAZING! So simple and delicious. I highly recommend you try this!! !